Our EcoCenter began as a desire for a more hands on natural science experience than could be provided in a typical school setting. In 1997, an addition to the school resulted in a quarter acre interior courtyard becoming available. The building of the pond and stream, and much of the expensive planting, took place during the summer of 1998. What you see today is the result of cooperation among teachers, students, parents and administration. Although a very attractive setting, our focus is on the natural science and ecology that we can observe, live and up close, in this very special setting. Click the links below to take a tour of the center. or cover many square miles. Any pollution in the watershed will eventually get into the stream. Where does rain go? Some falls directly onto a stream, but most of it falls on the land. Then some of the rain flows down hill into a stream. Water that soaks into the ground becomes groundwater and may end up in an underground spring or may be soaked up by plants and trees. Streams usually carry water to bigger streams and rivers. You could say a stream begins at its headwaters, often in the mountains, fed by an underground spring or the runoff from rain and snow melt. Rivulets of water flow downhill, merging together to become a stream which continues, mixing with other tributaries, until they all become a river flowing to the sea. The mouth of a river usually opens into the ocean in a broad bay where fresh water and salt-water mix, called an estuary. The length of a stream may be only a few feet from where it emerges until it joins another stream, or it may traverse hundreds of miles, from the mountains to the sea. Some streams flow year-round, others only after a storm or when snow melts in the spring. A stream is constantly changing its flow, its depth, even its bed, as anyone knows who has observed a stream in different seasons or at different places along its course. It scours, shifts channels, meanders, floods, erodes, carries and deposits silt. Squeeze a stream in one place, and like a water balloon, it bulges in another. Where it is restricted, the stream speeds up to compensate, eroding downstream banks or spreading out to flood adjacent property. Many factors shape the character of a stream as it progresses from its headwaters to its mouth: the slope and current, the amount of water being transported, its temperature and water chemistry. These, in turn, influence the vegetation, the animals, the bottom sediments, and the shape of the channel at any pint along the stream's journey. A "young" stream is easily recognized by the many twists and turns as the stream flows along. An "old" stream has eroded its banks so often that the stream has changed its course and begins to look like a straight line. Since our EcoCenter stream is man-made and plastic-lined, it will not change course, flood or erode. Our creek, bog and pond form an area known as wetlands. Wetlands are a very important part of our ecosystem. Many animals are born and feed in wetlands such as the stream, bog and pond in our center. Wetlands also provide a natural filtering system for the water flowing through them. A typical woodland pond also helps to prevent soil erosion, but since ours is a plastic-lined stream it would be difficult for erosion to occur. It is important that we keep our wetlands safe and pollution free to provide the needed areas for fish and animals to live, feed and grow. The next time you drive past the Blue Route on Route 1 going south, look for the new wetlands created by the highway construction company to help maintain the ecosystem in Springfield. When you visit our pond during the warmer months you may notice buzzing insects, croaking frogs, turtles sunning themselves, and of course, swimming fishes. Most insects do not survive the winter, but lay eggs, which will hatch in the spring. Look for insects in the warm months. Many birds fly south for the winter. This is not because it is too cold for them, but because there is very little food left for them during the winter in the area we live. Other animals in our center deal with the winter in different ways. Frogs and turtles hibernate in the mud at the bottom of the pond. Others will burrow under leaves or in the mud next to the pond. A hibernating animal has a very slow breathing rate and a heart beat that is much slower than normal. Ponds, such as ours, grow algae. Algae is a plant that uses minerals in the water and sunlight to produce food for algae growth. The algae also produce oxygen, which helps the fish and animals in the pond. Of course, too much algae growing in the pond is unhealthy, and certainly not very attractive. The Scenic Hills pond holds about 12,000 gallons of water, while the stream and bog hold an additional 2,000 gallons. The water is pumped from the pond up to the waterfall through an underground pipe. While the circulation of the water is powered by electricity rather that the sun, the fish and animals are quite real! tides, overflowing creeks or rivers, and rain. Other types of wetlands are marshes and swamps. Our bog is an area of shallow, slow moving water. It often supports plants that have roots in mud at the bottom of the bog, while the stalks and plant tops reach into the air above. A bog usually begins as a lake. As the lake floods and layers of dead plants, weeds, mud and animals fill in the lake, they become very shallow. The result is what we call a bog. Bogs, in turn, often fill in over many years and become dry land. Bogs are often compared to sponges since they can soak up huge amounts of water. Heavy rainfalls near or on bogs are soaked up. Then the spongy bog s-l-o-w-l-y releases the water. This slow release of water prevents flooding and keeps plants in the area wet and alive even in the very dry weather. Many animals and insects are born, live or feed in a bog. Because of this, birds often like to nest in bog areas since insects provide the birds with a rich food supply. The bog is often called nature's filter, since the slow moving water is cleaned and the many plants in the bog add much needed oxygen to the water. Water passing through a wetland carries mud and pollutants. The vegetation and soil in a wetland form a kind of sieve, trapping those materials and filtering the water. Bogs are the most likely place to find an interesting and usual group of plants--the carnivores. Carnivore is a work that describes a meat-eating animal. There are a few meat-eating flowers too. Bladderworts, Sundews, and Pitcher Plants all capture insects for food. Bog soil often does not have the type of plant food that certain plants need These meat-eating plants are able to get the needed food by digesting their prey. The John Heinz National Wildlife Refuge at Tinicum is a wetland located just 5 miles from Springfield. Tinicum is a very interesting place to visit with your family. There are several miles of trails and boardwalks for you to observe the animals, birds, plants and insects of a Pennsylvania wetland. The turtle we are probably most familiar with is the Common Box Turtle. 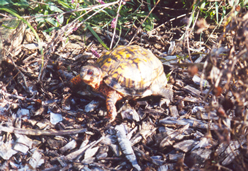 The Common Box Turtle is usually dark brown with orange or reddish patches in the shapes that form an attractive pattern. The skin of the turtle is brown and the males have colorful scales on their front legs. Box Turtles can live for over 100 years. We can find these turtles all over Pennsylvania. These turtles eat raspberries, slugs and mushrooms that are poisonous to people. Turtles live in or near water. Turtles are swimmers. Turtles that spend most of their time in the water have flat shells. The box turtles have taller shells since they are land dwellers. Tortoises look very similar to turtles but are land animals. Our EcoCenter has Red Sliders, Box Turtles and Green Pond Turtles. You will have to look very carefully and quietly to see the turtles. They like to hide under objects in the water. On quiet, sunny days, they may be seen sunning themselves on the side of the pond. We have several learning centers set up in the EcoCenter for use in curriculum-based activities for all grade levels. Draw/write about plants and animals in the ecology center. There are tubs filled with clipboards, paper, colored pencils and markers, as well as hand-held microscopes. Cards are included which will help you match the caterpillars you see with the adult butterfly it will become. Make animal tracks with stamped footprints. A tub is available which is filled with animal footprints for students to make tracks which can then be identified by fellow classmates. Our water table is a great place for sink and float experiments, as well as setting up a pond experiment. Tubs are available which include sink and float manipulatives and acitivities, pond animals and plants. Sequence trash to see what takes the longest, shortest, etc. amount of time to break down. Manipulatives are provided to put in order. Soil enrichment is shown over time with each student turning the handle a full rotation. Stones are placed in the EcoCenter for students to examine or rub to see fossils or outlines of plants/animals.